Like any successful business you need to communicate with your customers, and you need to get your message out there fast. By far the most direct, effective and economic way to grow your business is with the regular, strategic distribution of well designed, eye catching flyers. 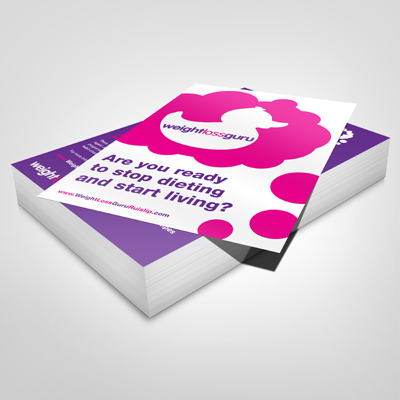 Full colour flyers are a powerful and cost effective method of reaching your potential customers. So, waste no time in getting your flyers into the hands of all those eager customers. Order your flyers by 1pm on a working weekday and they'll be delivered to you the next working day, so your message will be out there before you know it. Not everyone is a designer so you don't have to design your flyers yourself. You can choose from hundreds of striking, pre-designed flyer templates created by professional graphic designers and these are tailored to suit a wide range of professions. Whether you're a plumber or a masseur there's a slick, engaging design that's absolutely perfect for your business. Of course, equally important as design is print quality. In either A6, DL or A5 size, your flyers will be printed on high quality gloss or silk card and you can choose from either 250gsm or 300gsm card. They can even be laminated if you prefer, with a matt or gloss finish. I know what you're thinking. Sounds expensive? Far from it. Prices for next day flyer printing start from as little as £24, and delivery is absolutely free, wherever you are in the UK mainland.